We've been here on the FOB (Forward Operating Base) for a little over a week now. The outgoing group have all departed and we have begun to settle into our own routine. Each day we gather at 8:30 for accountability and then tend to our supply and equipment checks. Training for the morning consists of basic skills and then usually a trauma drill as we continue to sharpen the team for real patients. 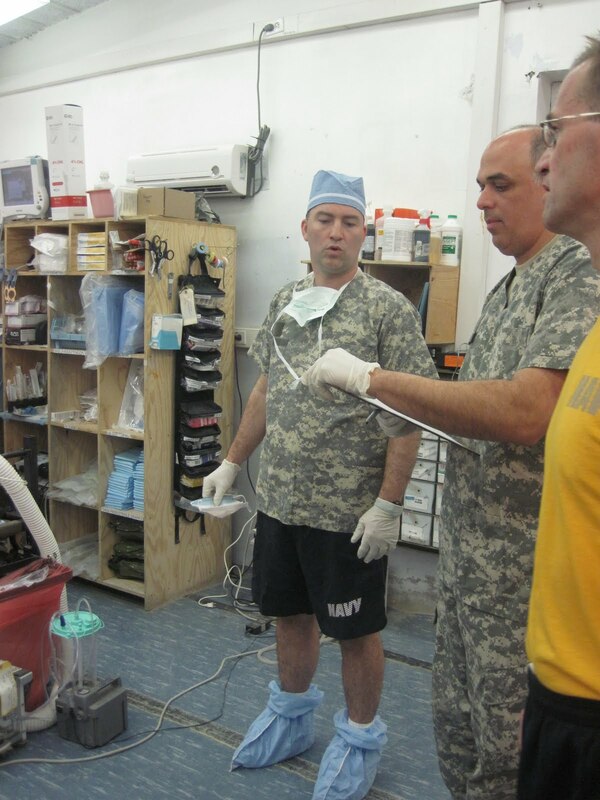 We break at lunchtime and then spend the remainder of the day doing more training and waiting for patients to roll in. As the sole orthopaedic surgeon, I hold clinic for coalition forces as well as Afghan National Army and Afghan National Police patients two days a week. The diagnoses I see in clinic are really no different from those we see in general ortho clinic back home. The only real difference is that if someone needs surgery they always have to get sent out. For US service members whose injury prevents them from being combat ready that means an end to their deployment and a trip to one of our MTF's outside of the theater of operations. Our accommodations here are not fancy but, for the next six months anyway, they are home. Four of us (three surgeons and our anesthesiologist) live in an old jail cell block left over from the Soviet occupation years ago. 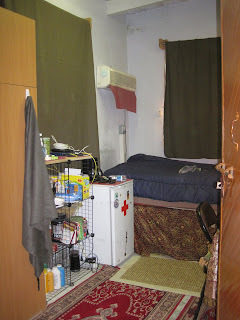 We share a common area which has been equipped with a small table we use for friendly poker games, a television connected to armed forces network, and a couple of cheap fake Persian rugs which you have to pay a dollar to walk on in shoes. Everything is dusty and no matter how hard you clean it doesn't take long for things to be dirty again. 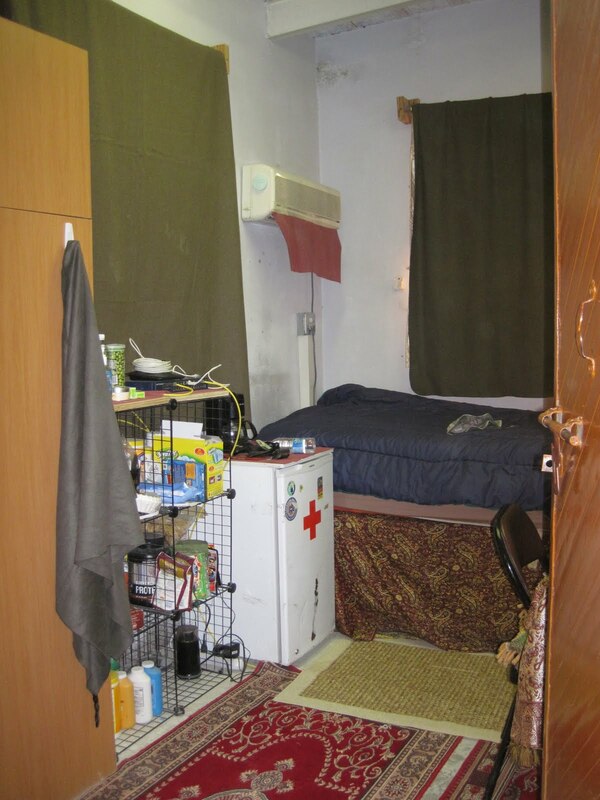 The individual "cells" that the four of us live in are about 8'x12' and have plywood furniture and standard issue wall closets in various states of disrepair. Cheap "tapestry" type material bought from a local vendor covers many surfaces to make things more cozy. The good news is that we all have Internet in our individual rooms. We have to pay top dollar for it or else use the SPAWAR computers in MWR which are crowded and have a time limit so the expense is certainly worth it! The ability to chat with the folks back home is priceless and, honestly, most people here would sleep in the mud for a year as long as they had a solid Internet connection. Internet access is truly a major morale booster! Thank you Edge City! Despite being in the middle of nowhere in a third world country, there is certainly beauty to be seen. Each evening, as the sun begins to set, I like to walk up to the "Front Porch" with my camp chair and just sit. 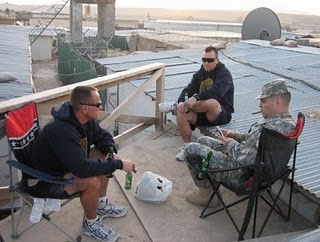 The sunsets are beautiful (thanks to all the dust in the air) and the camaraderie enjoyed while sitting "above it all" drinking near beer and smoking cigars is one of the little pleasures we have out here on the FOB. This deployment is like a marathon and those quiet moments of beauty are like water stations along the way. I really enjoy your postings and the great photos. p/s; was so sorry to hear about our good friend Dr. Mills. Prayers. I really admire what you are doing. I think so often of those around the world that suffer and are brought up in such humble and poor circumstances. I hope that some day i can give back like you are doing. I know i do what i can now but there is something to be said for being among people that have less and serving them in a way that could in no other way be possible.